If my name and voice sound familiar, you may have heard me on "The Morning MIX" on Orlando's MIX105.1 FM. I have been the on-air Producer of the morning show for more than 10 years. In addition to radio and weddings, I am also the backup PA announcer in the Amway Center for the Orlando Magic. Basically, my life is spent on a microphone and performing. I have DJ'd in just about every venue around Central Florida, from country clubs and hotels to civic centers and backyards. I am also a certified and approved Disney Wedding DJ, which allows me to work on all of their properties. And I'm on the approved list of DJ's for Lowe's Hotels, which includes all of the Universal Studios properties. 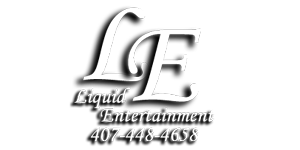 I am fully licensed and insured, which most venues in Central Florida require your DJ to have to work in their venue. For more than 20 years, I've been DJing weddings in and around Central Florida, with more than 1200 completely satisfied brides and grooms. The one question I get a lot is, "What's your style of DJing Jay?" I keep it classy and elegant, but guarantee that it's the best party ever, one that you and your guests will never forget. No props, no annoying DJ voice, no silly games, just an awesome party! The wedding is all about the bride and groom, not the DJ. That's why I've gone more than 20 years without advertising, it's amazing what word-of-mouth will do for a company if you do a great job and keep your promise to your bride and groom. The one thing I really stress to my couples, whether you choose me as your DJ or not, is do your research. Anyone can have a great sales pitch, but can they back-up what they're telling you? If you Google my name or company name, you will find 100's of reviews of my services ranging from "The Knot," "Wedding Wire," "One Wed," and other reputable wedding web sites. When you hire me, I work for you, you are the boss, not the other way around. You tell me how you want it and I will make sure your wedding day is exactly the way you have been dreaming of.